This adventure takes you through the less-visited corners of Peru. Along the way, you will connect with the history of pre-Columbian civilizations in remote archeological sites, pass through wild jungle in the Amazon Basin, and unite with the authentic spirit of the Andes in small villages. This trip takes you to Northern Peru – one of the least visited areas of the country. Starting in the coastal city of Trujillo, you have the chance to see nearly a dozen pre-Columbian ruins along this route. Many of these predate the Inca and are a lasting testament to the ancient civilizations that called Peru’s northern coast and highlands home. From Trujillo, you make your way into highland cloud forest and rolling hills, where you can explore still more ruins, before descending to the edge of the Amazon in Tarapoto. The trip ends with a river journey from Yurimaguas to the remote jungle Amazonian outpost of Iquitos. This trip is best done by public transportation or taxis. Local guides and taxis can get you out to the more remote ruins. The trip takes you from warm coasts to highland cloud forests and back down the other side of the Andes to the Amazon Basin. You’ll need warm clothes for the highlands, and light tropical-friendly gear for the lowlands. For jungle travel, consider a light long sleeve shirt and pants, plus good sun protection. You should bring bug spray containing DEET, a rain jacket, headlamp, binoculars and a camera with decent zoom. Generally speaking, it’s best to avoid road travel by night. Check travel clinics before you depart for required and suggested vaccinations. 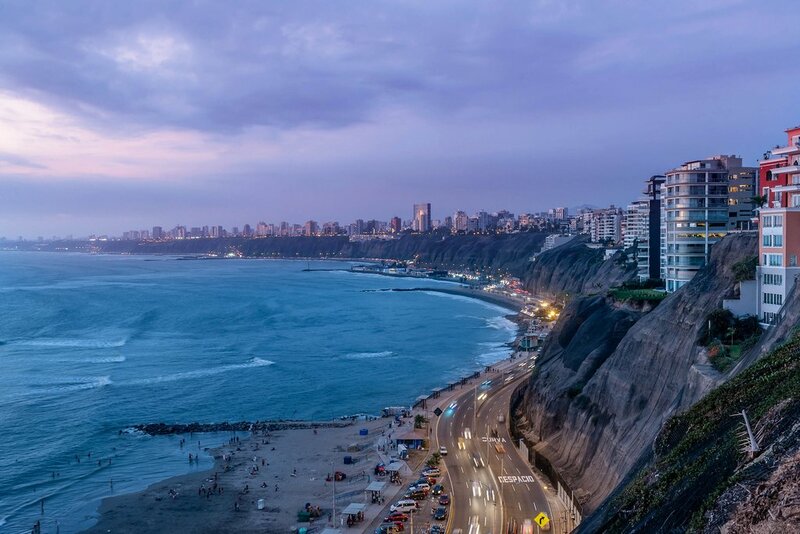 The Lima suburb of Miraflores, where the Pacific Ocean meets the coast. Start with a walking tour of the colonial center of this cosmopolitan capital, checking out perhaps some of the top-shelf museums and colonial architecture in Lima Centro. Next, visit the rougher port city of Callao just west of the city center to see one of South America’s best ceramics collections at the Museo Larco. You’ll want to stay for lunch in the museum’s café. Continue to tony Miraflores or slightly more party-hardy Barranco for amazing dinner, dancing and nightlife. Monument in the Plaza de Aramas in Trujillo. It’s around 9 hours from Lima to Trujillo. If you have your own vehicle, consider stopping along the way for a quick look at the Caral archaeological site outside of Barranca. The Caral culture dates back some 5000 years. Here you will find pyramids and large amphitheaters. You can spend an hour or so exploring the area, then continue to the little village of Casma for lunch and another side trip to the Sechín archaeological site – one of the better-preserved ruins on this coast. Get an early start (before 7am) from Lima as this is a long ride with several stop en route. 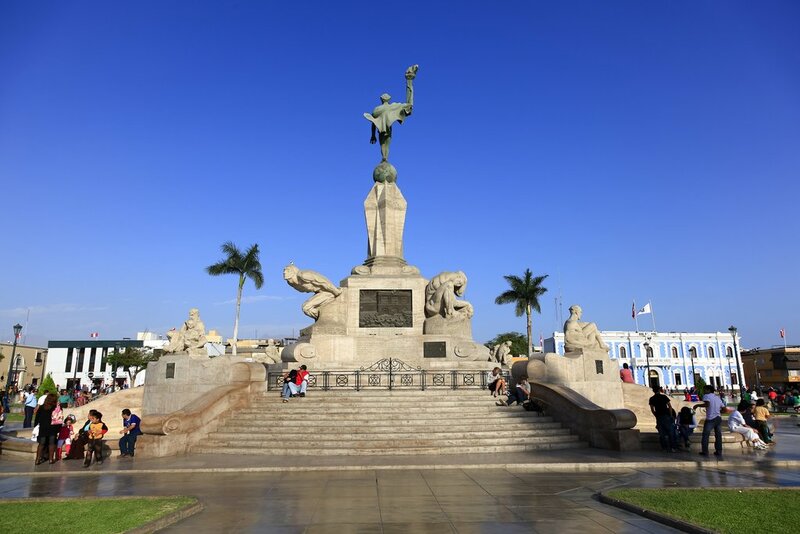 Take a morning stroll around the Plaza de Armas in the glorious colonial center of Trujillo. Then go for a tour of the Chan Chan archaeological site (just outside of town). It’s best to go with a tour from town, with a guide who can curate this massive site with its towering walls and fascinating carvings. That afternoon, head to Haunchaco for a seaside ceviche, perhaps a little surf session and a chance to watch local fisherman ride traditional caballitos de totora (curved reed rafts that look like ancient surfboards). During the remaining days in Trujillo, you can visit lesser-known archaeological sites such as Huaca Arco Iris and Huacas del Sol y de la Luna. About 60 kilometers north of here Huaca del Brujo is pretty far out there, but worth the trip if you have the time. There's some good surfing in nearby Puerto Chicama. 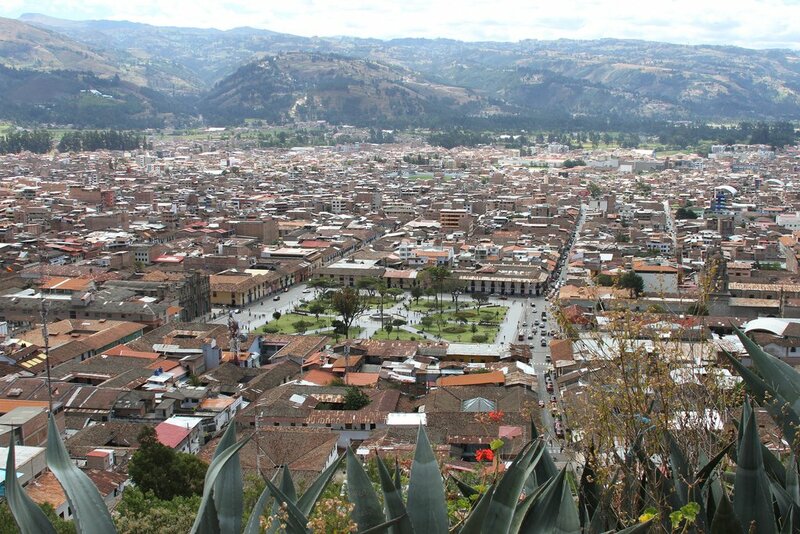 The city of Cajamarca, well-known for its pre-Hispanic archaeological sites and nearby hot springs. It will take at least 5 hours to drive from Trujillo to get to Cajamarca. You can consider stopping along the way at the truly wonderful ruins at Marcahuamachuco. 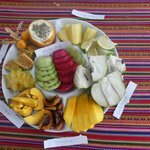 If not, make a beeline to Cajamarca’s town center for lunch somewhere near the Plaza de Armas in the colonial center, with a side trip to El Cuarto Del Rescate, where the Inca ruler Atahaulpa was held ransom. In the afternoon, head just outside of town to Los Baños del Inca. These ancient baths were the site of the fateful meeting between the Spanish Conquistador Pizarro and the soon-to-be-kidnapped Inca King. More evocative, however, is the wild pre-Inca necropolis just outside of town in the Ventanillas de Otuzco and Cambayo. 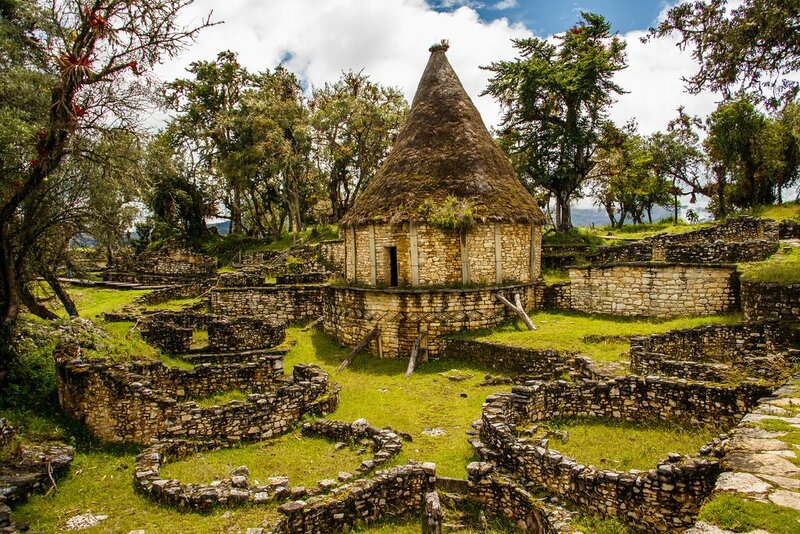 With an extra day in Cajamarca, take a side trip to the historically significant ruins at Kuntur Wasi, which offer up amazing views from a mountaintop and well-run museum. 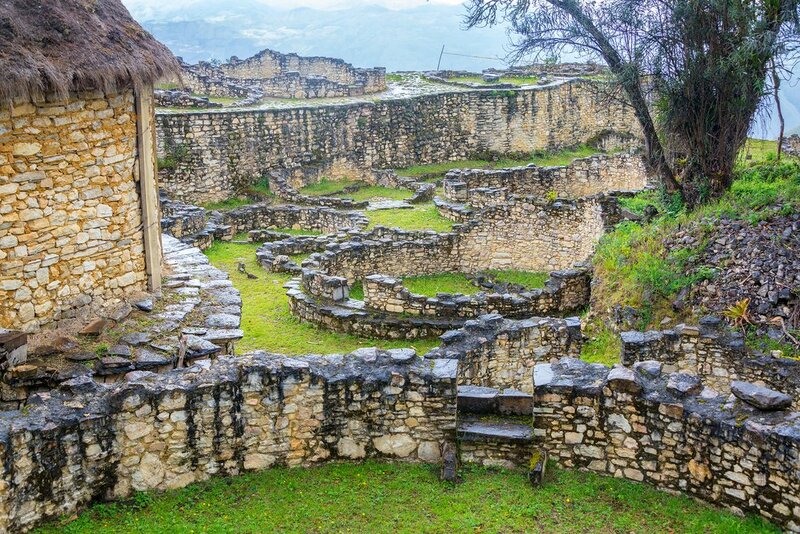 The lost city of Kueláp makes for an excellent day trip from Chachapoyas. Up in the Andean cloud forests, the laid-back village of Chachapoyas is the starting point for adventures large and small. With a few extra days here, consider going through Marañon Canyon on the 5-day Gran Vilaya Trek. With just a few days, you will want to check out some of the breathtaking miradores (viewpoints) just outside the city. The true highlight of your trip here, and probably the thing you will remember most, is an excursion out of town to the remote and forgotten fortress Kuélap. This monumental citadel is breathtaking. Not just for the views down to the rolling hills below, but also for the sheer size and grandeur of the site that was built between 500 and 1493 AD. It’s also one of the most visited of Peru’s major archaeological sites, so try to get here at dawn to have some quiet and solitude. A new cable car takes you easily to the ruins, but you can still hike up if you want the exercise. Peru's Catarata de Gocta waterfall. It’s another long drive to the foot of the Andes and the edge of the Amazon in the bustling city of Tarapoto. 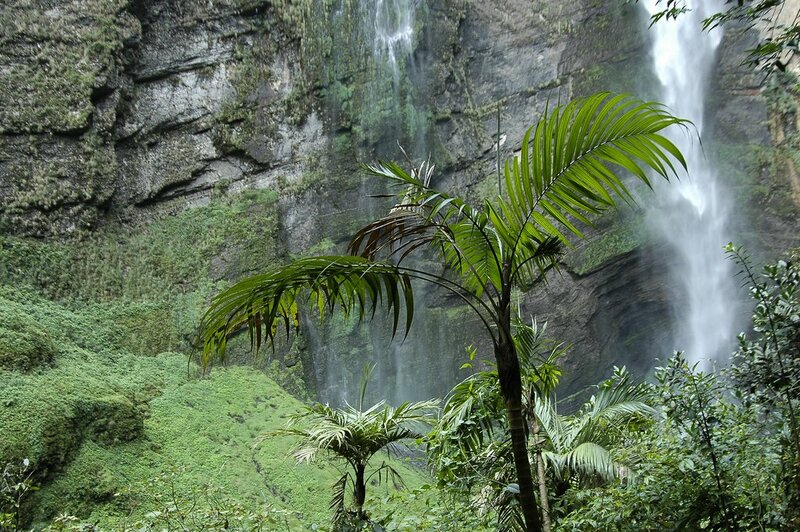 On the way it's possible to take a 6-hour hike to the towering 771-meter-high Catarata de Gocta waterfall. Otherwise, it's possible to just to visit Cocachimba and get a glimpse of the waterfall. From Tarapoto, you can take an afternoon journey to the Laguna Azul for some waterfall viewing and some undeveloped hot springs. If you want to add a day here, tack on a rafting trip on the Río Mayo for Class II and III rapids. 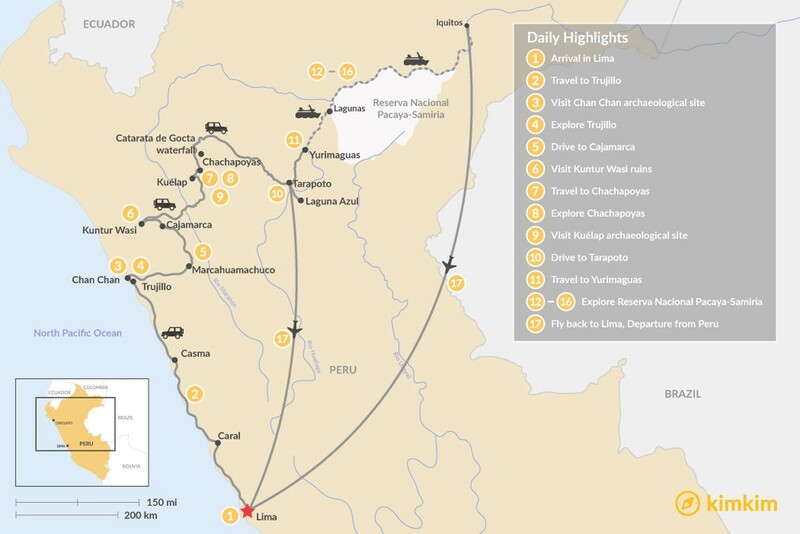 Note that a direct drive from Chachapoyas to Tarapoto with any stops is 6 hours minimum by private car, 8 hours by bus. This forgettable city is the starting point for wild Amazon adventures. You just need to be in town long enough to arrange your onward travel (in nearby Lagunas), stock up on food and supplies and hit the ATM. 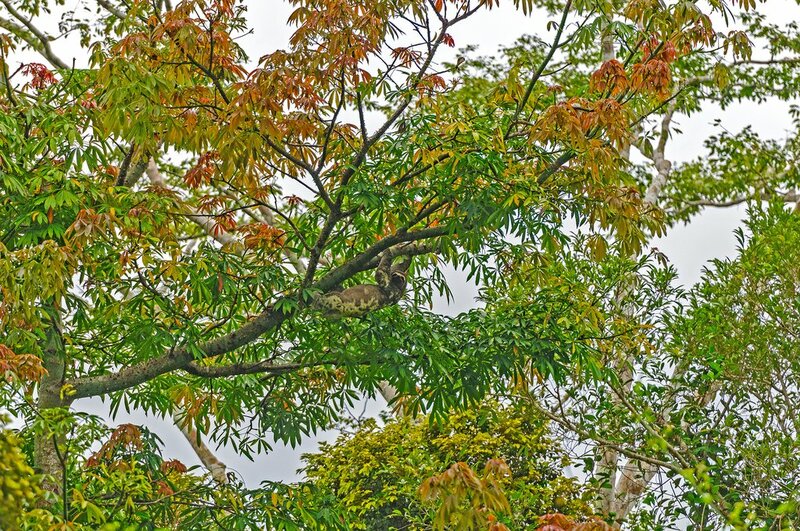 Tree sloths are a common sight in Reserva Nacional Pacaya-Samiria. At the end of the road, the river begins. With a guide from Lagunas, you can arrange for journeys both short or long into Reserva Nacional Pacaya-Samiria (Pacaya-Samiria National Reserve). This 20,000-sq km reserve is Peru’s largest. Just outside Lagunas, don’t expect to see much. But travel a few days into the park by dugout canoe, and you’ll start seeing the bird life, animal life and the pulsing beat of biodiversity that makes this park unique. Short journeys by speedboat from here into the park are also possible. Departing from Lagunas, you have an option of taking a cargo boat down the Amazon to Iquitos. The journey takes 4 or 5 days but private cabins are available. 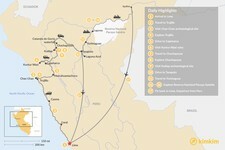 The only other option is to fly to Iquitos from Tarapoto (skipping Yurimaguas) and make your jungle treks from Iquitos. Getting back to Lima can be a challenge. If you take a boat all the way to Iquitos, you can get a flight out. If not, head back to Tarapoto for a flight back to the capital.